The consumer portion of the US economy continues to expand. The industrial portion, most exposed to global weakness, continues to be negative. After averaging over 200,000 during 2014 and the first half of 2015, the last two months have featured job growth beginning with a "1." A surprise? Well . 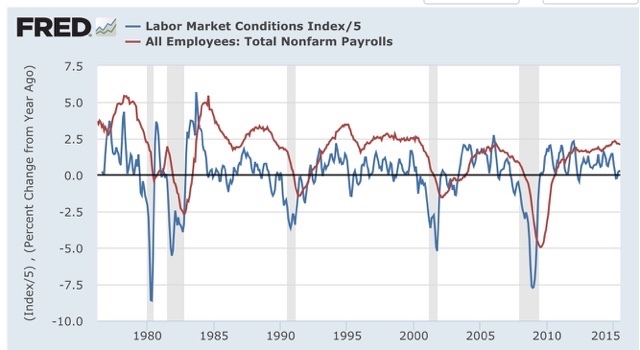 . .
"Since the LMCI does lead the much smoother YoY growth in jobs, it strongly suggests that YoY payroll growth is going to decline over the next 6 months or so. And that can only happen if those payroll numbers generally come in under 225,000, and probably even below 200,000 through next winter." 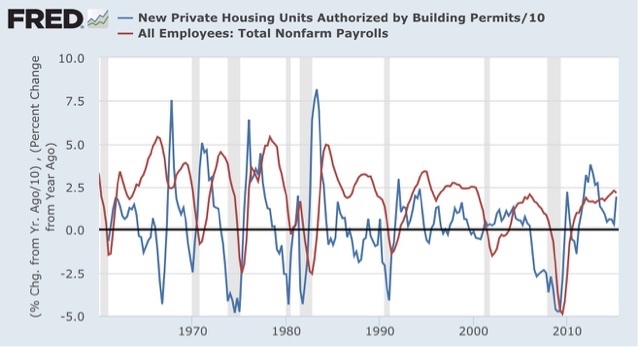 "While a steep decline to a stall in housing, as happened in 2014, has not always led to a stall in jobs, usually it has led to at least some weakening, sometimes slight, sometimes very marked. Since the lead time varies between 6 to 18 months, we are about due for last year's weakness in housing to lead to some weakness in payrolls." As I get to say from time to time, you are reading the right blog. July was revised downward by -22,000. August was also revised downward by -37,000, for a net change of -59,000. The more leading numbers in the report tell us about where the economy is likely to be a few months from now. These were negative. the average manufacturing workweek fell -0.2 hours from 41.8 hours to 41.6 hours. This is one of the 10 components of the LEI and so will affect it negatively. construction jobs increased.by 8,000. YoY construction jobs are up 199,000.
manufacturing jobs decreased by -9,000, and are up 92,000 YoY. Professional and business employment (generally higher-paying jobs) increased by 31,000 and are up 604,000 YoY. temporary jobs - a leading indicator for jobs overall - rosse by 4,600.
the number of people unemployed for 5 weeks or less - a better leading indicator than initial jobless claims - rose by 268,000 from 2,095,000 (the post-recession low) to 2.363,000. Overtime declined -0.2 hours from 3.3 hours to 3.1 hours. the index of aggregate hours worked in the economy declined by 0.2 from 104.0 to 103.8. The broad U-6 unemployment rate, that includes discouraged workers fell by -0.3% from 10.3% to 10.0%. the index of aggregate payrolls declined by -0.3% from 124.6 to 124.3 .
the alternate jobs number contained in the more volatile household survey decreased by -236,000 jobs. This represents an increase of 2,193,000 jobs YoY vs. 2,708,000 in the establishment survey. Government jobs rose by 24,000.
the overall employment to population ratio for all ages 16 and above fell -0.2% from 59.4% to 59.2%, and has risen by 0.2% YoY. The labor force participation rate also fell -0.2% from 62.6% to 62.4% and is down -0.5% YoY (remember, this incl udes droves of retiring Boomers). Last month we had a "meh" headline jobs number with great internals. This month we had a "meh" headline number with poor internals. From a second month of sub-200,000 job growth to manufacturing hours to revisions of past months to declining e/p and labor force participation ratios to declining aggergate hours and payrolls, this was a poor report -- which basically took back last month's great report. If you want a bright spot, it was the continued big decline in involuntary part time workers, which also drove down the U6 unemployment rate to 10.0%. Below this number is where I expect nominal wage growth to finally improve. This decline in employment trend growth is something I have seen for a number of months, as last year's poor housing market feeds through the rest of the economy this year. This decline is also obviously about the continuing international deterioration feeding through the strong US$ to a shallow industrial recession (but a continuing consumer expansion) here. I have a new post showing trends in the housing market up at XE.com . Right now is a good time to show how changes in intrest rates feed through first to sales, then prices, and finally inventory. It's the econo-geek version of watching a python digesting a meal. I'm just never going to score well on the "plays well with other progressives" conduct rating. The use of misleading or dishonest, cherry-picked statistics sets me off, whether it is done by a right wing nut case or a left winger. Hell, my coblogger Bonddad has made a cottage industry of calling out John Hinderacker for that stuff. Originally I was going to call this dishonest, but I'll settle for "misleading." To be sure, I don't dispute the overall point, which is that the wealthy have disproportionately gained during this 6+ year expansion, while wages for the middle/working classes have remained stagnant. Outside of Bernie Sanders, I know of no candidate for President seriously making an issue out of this. So why am I so annoyed with Atrios? Because he chose the cheap shot with a misleading statistic rather than honest analysis. The source of the above graph is Pavline Tcherneva of the Levy Institute. I have no beef with her whatsoever, and I had a perfectly civil and helpful exchange with her earlier this year. But here is what the graph does. It measures the growth in incomes over *ENTIRE* previous expansions (measure from income peak to income peak), vs. the first 3 years of Obama's. The last bar in the graph indicates that it runs through 2012. In other words, the graph compares one apple with a bunch of oranges. 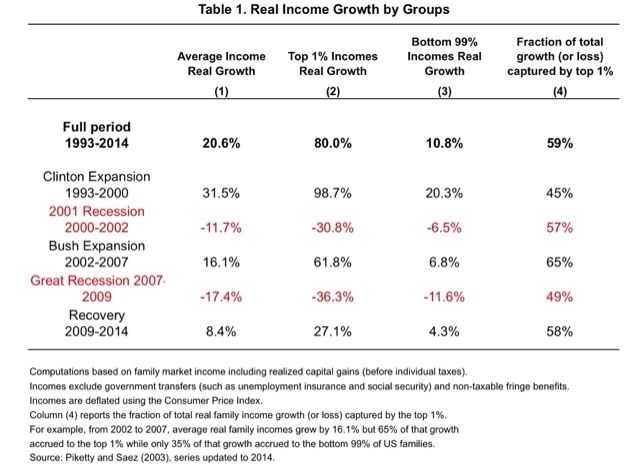 To be comparable, it should have compared the first three years of income growth in other expansions vs. Obama's. That's the first gripe. But above and beyond that, it isn't even current, by a factor of nearly 3 years! Through 2014, the wealthy had seen a share of income gains comparable with both the Clinton and Bush 2 expansions. The bottom 90% fared much better during the Clinton years than either Bush 2 or Obama. And of course, the Obama expansion isn't over yet. BTW, Saez should be publishing his final 2014 report shortly. 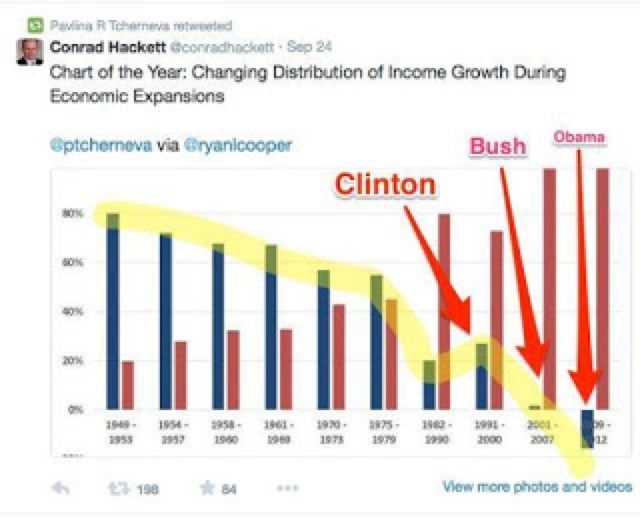 Since from Clinton peak to Bush 2 peak, the lower 90% only saw a 1% income gain, it should be interesting to see if that has was surpassed in 2014.